Because of my precious Clarence’s difficult health situation right now, I’ve postponed my summer trip to New York. But there are several things I’m planning to do there, for fun and review purposes, so I want to tell you about a few of them, for those of you who are there now. I’d hate you to miss them just because I may have to. Ringling Bros. Circus in Coney Island–this is the one that you absolutely can’t miss, especially if you have children with you. I went to it last summer and it was fabulous. (Last year’s review: http://www.itsnotaboutme.tv/news/2009/10/06/coney-island-boom-a-ring%e2%80%8f-circus/.) It’s a different edition this year, so I’m hoping they can keep up the great work. I’m just about positive that they can! 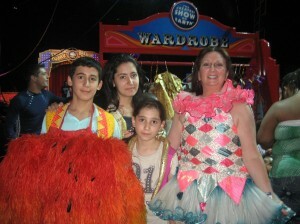 Karen with Abramov Family at last year's Ringling Bros. Circus in Coney Island. This year, the show is called Illuscination, and I expect to see even a bit of close-up magic, along with traditional circus acts. I believe it’s one ring again, which makes it so intimate. I love that! If you go see the show before I get the chance to review it for you, don’t forget to get there an hour early for the free-to-ticket-holders All Access Pre-show. It’s great! You get to meet the performers, learn some easy circus skills, and see animals close-up and personal. Last year, I forgot to review the food court for you, so hopefully, I’ll remember to do that this time. It’s just that I get kind-of stupid in the heat, so I’ll ask my junior reviewers to try to remember for me. The Hamptons–I’m planning to be doing several restaurant reviews there, including Oso at Southampton Inn, which sounds wonderful to me, and a second trip to the recently re-opened Madame Tong’s Redeux. (I know, I know, my grammatical pals–the real word is “redux,” but this is how the restaurant spells it, so I have to write it like this.) I stopped by for some appetizers in it’s last incarnation, and my mouth is watering to return. I’m planning to be there for Super Saturday, my favorite event in the Hamptons all year, and the one that turned around my feelings for the entire resort area. I hadn’t been a fan before, but once I got to this event a few years ago, I vowed to go back every summer. I’m keeping my fingers crossed that I get there this year. Via dei Mille–for my touch of class in the city, I’m planning on paying a return visit to this happening eatery. I had written a review of it when it first opened for my column at BeverlyHillsPeople.com, but, due to many personnel changes, the web guys never got it posted. It’s a couple of years later, so that info may not be applicable for this site now, so I’m going to try my hardest to get to them again. I’m glad to see that they’re still going strong all this time later because that is rare in the restaurant business. 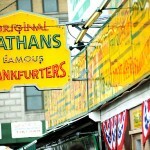 Nathan’s–And last, but always best to me, will be my multiple visits to the hallowed Nathan’s in Coney Island. 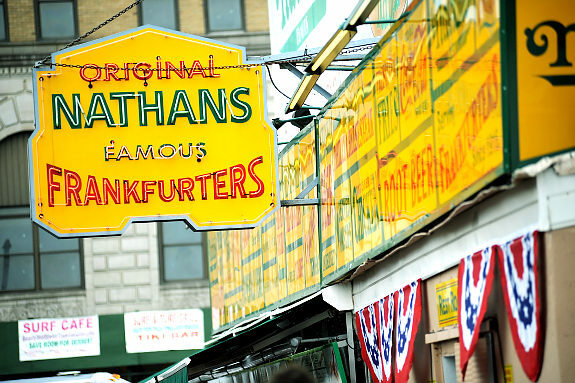 I may not be a challenger for their famous hot dog eating contest, but I can pack down a dog or two with the best of them. And I still covet those skinny red forks that come with the only fat fries I eat. I’m dreaming of the experience right now! Hopefully, I’ll see all you New Yorkers very soon, with a smile on face. So save a dog and a clown for me, please.